Creating professional looking web galleries has never been easier or more flexible than with our MD2 Thumbnailer. With an intuitive user friendly interface, you can start creating thumbnails in seconds. Add effects, sharpen, auto correct and more! Very easy to use - Creating a web image gallery has never been easier! Just click a few buttons and watch your gallery come alive with mouse rollover effects, drop shadows, custom colour schemes and much more! Powerful - Recognizes all popular image formats and EXIF tags, resizes pictures using smart algorithms earlier available only in full-fledged image editors. Choose from 3 re-sampling methods and 4 smart resize methods. See the effects of option changes in real-time. EXIF Support - Includes an EXIF file viewer which allows you to view all the data stored in your photos by your digital camera. MD2 Thumbnailer will even rotate your photos automatically if your camera has an orientation sensor, so no more manual rotating! Artistic - Recover shadows, adjust saturation, brightness, RGB levels and more! Add effects to both the thumbnails and the big gallery images. Built in plug-ins which allow you to sharpen and blur your photos and flexible text compositing functionality, to allow you to add text to your photos (such as copyright notices). Value for money - A built in FTP client means you don't have to shell out for extra software to publish your gallery to the internet. MD2 Thumbnailer is all you need. 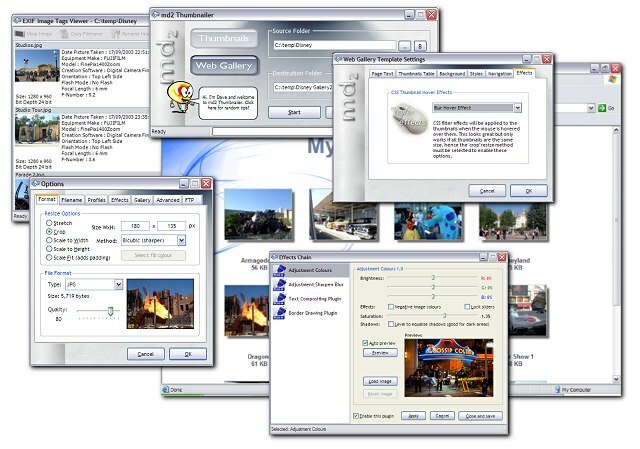 Furthermore, extra effects can be added to the software by our unique plug-in architecture. We will be releasing more plug-ins in the future, and offering them for FREE download to our customers. User friendly - Intuitive bubble help explains every little detail of the software so that know exactly what to expect. All options are grouped in easy to understand categories so that you can effortlessly create galleries, without any knowledge of WWW or HTML. Flexible - You have total control over every tiny detail of your web gallery. You can even create your own custom HTML templates and let MD2 Thumbnailer insert the tables and navigation for you. Time Saver - Save settings in a profile and apply it to different sets of photos. Photo File Organizer is a program that truly will organize and clean up your photo collection. The main function of this program is to rename your photo files based on the date the photo was taken and the camera manufacturer/model. This site does not contain serial number, crack, keygen MD2 Thumbnailer serial number : serial number is the simplest type of crack. A serial number(cdkey,product key,etc) is register the program as you may already know. a crack or keygen may contain harmful software. If you cannot find the exact version you want, just give it a try. for more information read .nfo/.txt/.diz file include in zipped file.